Spring is officially just around the corner, the weather forecast for the next week is warm and sunny, and it’s time to start transitioning to cooking with warm weather ingredients. Strawberry season is about to start up in South Carolina and soon their juicy goodness will be gracing the table in the form of shortcakes, smoothies, and pies. But the star of this recipe is another red fruit that often plays second fiddle to strawberries- Raspberries. I love them! This recipe is fabulously easy. Just prepare a simple blondie batter using simple ingredients, stir in some pecans, and plop the raspberries on top. 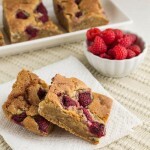 The result is a chewy, sweet, buttery blondie studded with pecans and topped with juicy raspberries. 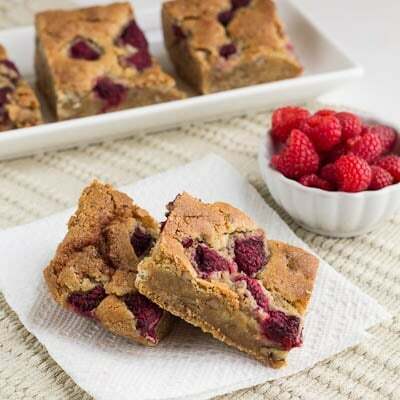 The raspberries add a little tartness that helps balance the sweetness of the blondie. They even taste good straight out of the refrigerator. 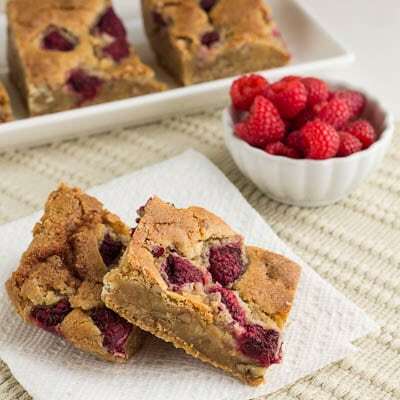 Next time I make this Raspberry-Pecan Blondies recipe, I think I’ll add some white chocolate chips to the batter to really take it over the top. Preheat oven to 350 degrees and line a 9x9x2-inch metal baking pan with aluminum foil, extending foil over sides of pan by 2 inches. Butter and flour the foil. In a medium bowl, whisk together flour, baking powder, salt, and baking soda. Beat together brown sugar and butter using an electric mixer until light and fluffy. Beat in eggs one at a time, scraping down sides of bowl as necessary. Beat in vanilla. Add flour mixture, beating just until blended. Stir in pecans and spread batter in prepared pan. Sprinkle raspberries on top. Bake for about 50 minutes, or until golden on top and a wooden toothpick inserted in center comes out clean. Place pan on wire rack and cool completely before cutting. Store in refrigerator. This entry was posted in Brownies and Bars, Desserts and tagged blondies, raspberries. Bookmark the permalink. Oh yum, your blondies look so delicious! Thanks for the recipe! I have to try it out some time!